The real estate industry focuses on buying, selling, and appraising residences, commercial buildings, undeveloped land, and other types of public or private property. Real estate professionals typically have backgrounds in finance, marketing, and other business-oriented fields. They are also skilled communicators with extensive knowledge about building regulations, zoning policies, and other laws guiding modern-day real estate. Many professionals in this field begin their career by earning an associate degree in real estate. Real estate associate programs often include internships, which are held at property management offices, real estate brokerage firms, and other workplaces. Many of today's students choose to earn their associate degree in real estate online rather than in a classroom. The asynchronous (or self-paced) format of most online real estate programs proves ideal for students with part-time jobs, childcare obligations, and other commitments that may interfere with attending courses on a college campus. Learn more about what you can do with an online associate degree in real estate and what kind of career opportunities you can look forward to with this comprehensive guide. WILL AN ONLINE REAL ESTATE DEGREE PROGRAM PROVIDE ME WITH THE SKILLS I NEED TO ADVANCE MY CAREER? Many careers in real estate -- including agents and brokers -- are attainable with a high school diploma, so an associate degree in real estate will further bolster a candidate's standing in the job market. Associate in real estate programs provide a comprehensive overview of property law, real estate valuation and appraisal, property management, mortgage requirements, and other fundamental areas of the industry. Students also take multiple courses in sales, marketing and advertising, and communications. WILL AN ONLINE REAL ESTATE DEGREE PROGRAM WORK WITH MY SCHEDULE? Online associate degree in real estate programs offer a flexible alternative to traditional, classroom-based education. Students are able to access course lectures and readings, participate in virtual discussions with other students, submit written assignments, take exams, and communicate with professors from the comfort of their own home. Current technology also enables them to study on the go using a laptop, tablet, smartphone, and other portable devices with WiFi capabilities. For added convenience, online students can usually coordinate internships at sites near their current residence. WHAT JOBS CAN I GET WITH MY REAL ESTATE ASSOCIATE DEGREE? Agents and brokers comprise the largest number of real estate professionals. According to the Bureau of Labor Statistics (BLS), more than 420,000 agents and brokers are currently employed in the United States. The BLS notes that these positions can usually be obtained with a high school diploma, although all 50 states and the District of Columbia require agents and brokers to be fully licensed. The best online associate degree in real estate programs prepare students to complete their state's specific licensure requirements, which generally include post-degree work experience and a comprehensive exam. Other common occupations in the real estate industry include appraisers and assessors, property inspectors, and property managers. 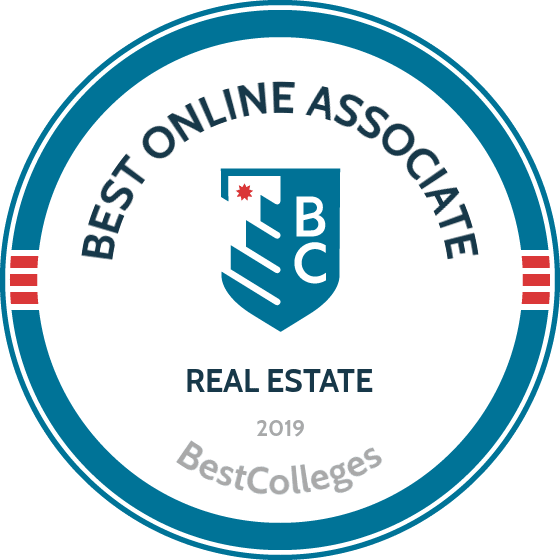 WHAT ARE THE BEST ONLINE REAL ESTATE ASSOCIATE SCHOOLS? Choosing a program is an incredibly personal decision, and only you can properly evaluate whether a target school's strengths match your educational needs. The following ranked list of schools should serve as a helpful starting point in your search for the best online associate degree in real estate programs in the United States. If you are considering an online associate in real estate, be sure to contact admissions specialists at different colleges and universities to learn more their about specific associate degree requirements and offerings. Florida State College at Jacksonville offers a well-regarded Real Estate Sales Agent Workforce Certificate program that provides students with the educational background needed to earn a real estate license. With licensure, graduates of the program can enter potentially lucrative career paths as real estate sales agents, brokers, or sales office managers or owners. FSCJ offers flexible course delivery methods, including a 100% online option with strong appeal to distance learners and students who work full time. The program focuses on teaching students how to assist both buyers and sellers in property transactions. Additional coursework covers essential supplementary topics, including real estate licensing law, federal and state housing laws, and Florida-specific property ownership laws that cover issues like property deeds, titles, and restrictions. Students also receive thorough instruction in the proper operation and management of a brokerage or sales office, giving them well-rounded training for a variety of future career roles. Students qualify for graduation after completing 63 contact hours of coursework. Transfer students must undertake at least 25% of their coursework at FSCJ to qualify for the certificate, which meets the educational requirements needed to sit for the Florida's Real Estate Sales Agent licensure examination. Program applicants require only a high school diploma or GED for consideration, and in-state residents enjoy very accessible tuition rates. FSCJ enjoys strong academic rankings and counts among the most affordable public four-year colleges in the United States. Accreditation by the Southern Association of Colleges and Schools Commission on Colleges ensures students emerge with career-ready skills. Houston Community College maintains an inclusive open-admission policy and a strong dedication to providing students with valuable and practical career training opportunities. The college's two-year general real estate program leads to an associate of applied science, preparing graduates for further studies at the bachelor's level or direct entry to lucrative real estate careers. The program's innovative design supports professional development paths in both residential and commercial real estate. This online real estate degree program leads to roles in areas including property management, real estate investing, and comparative market analysis. Graduates also meet the academic requirements for the Texas real estate salesperson and broker licensure examinations. Students can complete all degree requirements online. Houston Community College maintains "2+2" transfer plans with dozens of public and private Texas-based universities, which facilitates easy transitions for students planning on continuing into four-year bachelor's programs in related fields at participating institutions. An engaging capstone project that combines theoretical learning with practical training marks one of the program's unique differentiators. In their final semester, students choose a specific real estate technical discipline, identify specific learning objectives in tandem with faculty advisers, then engage in an intensive paid work-study program that covers a minimum of 20 hours per week. The capstone gives students the opportunity to apply their knowledge of core concepts covered in previous coursework, which includes topics like agency and contract law, property appraisal, real estate investing, and loan origination and quality control. Based in Ohio, Marion Technical College offers flexible options to students interested in expedited training for careers in real estate. The real estate option of the school's associate in business management program offers two practical study paths. First, students can take a set of four preparatory courses needed for the Ohio Real Estate Salesperson licensure examination. Learners can complete all four courses in a single semester, then take the exam. Course topics include principles and practices of real estate professionals, property appraisal, real estate finance, and real estate law. Alternately, students can take four prep courses before proceeding into the real estate concentration of the school's business management associate degree. Full-time students can complete this program in the equivalent of two academic years, and graduates can then take the Ohio Real Estate Broker examination to fulfill the state requirements for professional licensure. Widely recognized as one of the nation's top providers of online real estate college degrees, Marion Technical College offers practical training in property marketing, customer service, business technology, and communications. Courses in these subject areas are included as part of the school's two-year online real estate degree program. Out-of-state students enjoy advantageous tuition rates that apply only a slight premium to the fees paid by Ohio residents. Marion Technical College also allows students in good financial and academic standing to pay their tuition in four affordable installments, making the school's programs even more accessible. North Lake College offers a convenient online real estate degree option that delivers strong fundamental skills. The school's associate of applied science in real estate program helps students build proficiencies in key subject areas that prepare them for professional success in decision-making positions. Delivered over 60 credits, the North Lake College program leads directly to rewarding careers and further study opportunities in online real estate bachelor's degree programs. Students pursue coursework in the practical, technical, and marketing aspects of the real estate industry, earning the ability to conduct appraisals and property inspections, manage contracts, identify investment opportunities, and market properties to buyers. Electives offer specialization options in subject areas such as real estate technology, property management, and sales principles. Students can also reserve six of their 60 credits for cooperative education and internship opportunities, giving learners a place to use their new knowledge in real-world situations. Dallas County residents enjoy deep tuition discounts, but out-of-state and international students can still access high-quality educational opportunities for a fraction of the typical cost. Incoming transfer students can take advantage of generous policies, but they must complete at least one-quarter of the degree requirements at North Lake College to qualify for graduation. Students who successfully complete the program can apply their learning toward the professional licensing requirements established by the Texas Real Estate Commission. This allows graduates to quickly transition into careers as real estate sales representatives and brokers, as full-time students can complete the degree in just four semesters. Austin Community College features an acclaimed certificate program in real estate licensing, which delivers 180 hours of valuable classroom instruction spread across five core classes. Topics cover essentials such as foundational principles of real estate, agency law, contract law, and finance. Students also undertake two electives, and graduates are eligible to take the Texas Real Estate Sales Licensing Exam. One particularly attractive feature of ACC's online real estate program is its accreditation pedigree. ACC's real estate certificate program features endorsements from the prestigious Accreditation Council for Business Schools and Programs and the Texas Real Estate Commission. ACC also holds institutional accreditation from the Southern Association of Colleges and Schools Commission on Colleges. ACC offers another study option for established professionals who need to update their mandatory continuing education credentials. This pathway covers legal updates and ethics considerations for brokers and salespeople. The Texas Real Estate Commission also endorses these continuing education offerings, making ACC a one-stop educational resource for both emerging and current real estate specialists. Both study options feature low tuition rates that reflect ACC's mission to provide accessible and affordable career and technical training. With a current enrollment of more than 70,000 students, ACC ranks as one of the largest higher education institutions in Texas. Out-of-state residents pay only slightly higher fees than out-of-district Texas residents, while students who live in the Austin area enjoy some of the state's most affordable higher education opportunities. What Else Can I Expect from an Online Real Estate Degree Program? As in any field, courses differ depending on which individual online associate in real estate program you choose. All programs share certain core courses, as they must ensure that graduates possess the necessary competencies for the real estate industry. Below, you can find a sample set of five common real estate courses. Real Estate Marketing: This survey covers a variety of topics related to marketing a real estate business. Those topics include time management, marketing psychology, advertising, listing procedures, negotiating, closing, professionalism, ethics, and sales. In most cases, students complete this course within their first two semesters. Real Estate Mathematics: This broad course covers basic math skills that students need to master for successful real estate careers. These skills include percentages, appreciation, logic, interest, and closing statement estimation. The course includes case studies that apply these mathematical topics in real estate contexts. Real Estate Finance: This introductory course provides students with the basic financial background they need to successfully operate as real estate agents. Topics include money markets, systems, federal programs, closing costs, loan processes and procedures, equal credit opportunities, and mortgage loan sourcing. Appraisal: This course uses a survey approach to teach students about all aspects of appraisals. Students learn about the social and economic factors that go into an appraisal, market data, and other techniques. It includes plenty of case studies to give students hands-on experience making appraisals. Internship: Students complete direct experience at a real estate firm approved by their program, applying everything they learned in the classroom in the field. As not all programs offer internships, programs that do offer these opportunities often distinguish themselves from their peers. How Long Does It Take to Get an Online Associate in Real Estate? An online associate in real estate typically takes two years of full-time study and around 60 credits to complete; however, several different factors can alter that standard completion time. In most cases, synchronous online programs (live online classes) can provide more defined completion times than asynchronous online programs (no set class times), as synchronous programs offer greater structure. Similarly, cohort learning programs -- in which students complete the same course sequence with the same peer group -- offer higher graduation rates than individually paced programs thanks to greater structure and support. Nevertheless, self-paced asynchronous programs provide a great option for disciplined students. Students who easily keep on top of their work in asynchronous programs can sometimes finish faster than students in cohort programs. As such, students should choose the delivery method that fits them the best, as a better programmatic fit likely leads to the quickest completion times. Students should enroll in online associate in real estate programs at schools that hold regional accreditation. Regional accreditation indicates that a school meets the educational standards established by accrediting agencies. Many employers do not recognize degrees from schools that are not regionally accredited. Prospective students should check schools for regional accreditation from one of six regional accrediting bodies, as the process operates geographically. National accreditation applies to specific fields. For example, the Council for the Accreditation of Educator Preparation evaluates master's in education programs. The real estate field does not have a national accrediting body. Students applying to real estate programs need only worry about regional accreditation, the more rigorous and competitive of the two. The U.S. Department of Education and the Council for Higher Education Accreditation (CHEA) oversee the accreditation process. The U.S. Department of Education oversees all matters related to public education, including accreditation. CHEA focuses exclusively on higher education accreditation, vetting schools and offering access to publications and research. Both organizations ensure the quality of higher education throughout the United States, evaluating schools against a set of standards. Interested students can find a list of all accredited schools on the CHEA's website or the U.S. Department of Education's website. Beginning in 2006, the U.S. housing market began to experience a steep decline that lasted until 2012. During each year of the housing crisis, roughly four million homes and 2.5 million businesses received foreclosure notices. The real estate industry was crippled as a result; according to estimates, nearly 500,000 finance and real estate professionals lost their jobs between 2006 and 2010. Four years later, the housing market had mostly rebounded and the employment outlook for real estate professionals was much more favorable. A recent survey by U.S. News & World Report found that real estate agents currently face an unemployment rate of 2.6%; by comparison, the national unemployment rate for all occupations currently sits at 3.7%. Using data from this survey, the following table compares the unemployment rates of real estate agents and other sales professionals. Real estate agents held the lowest unemployment rate of all sales-oriented professions listed in the U.S. News survey. And as the housing market continues to regain its strength as projected in the years to come, the job security for real estate degree-holders should remain fairly steady. According to the Bureau of Labor Statistics (BLS), real estate agents earn a median annual salary of $47,880 -- roughly 13% more than $37,690, which the BLS currently estimates as the median annual income for all occupations. However, salary expectations for real estate agents and other industry professionals will depend on specific job titles and the employee's level of work experience. Other factors to consider include company/organization size, earned certifications, and city/state of employment. The following table looks at career salary growth projections for five of the most common real estate occupations. Of the five careers listed, real estate appraisers or assesors experience the highest rate of career salary growth: an 83% increase in earnings between the entry-level and late-career stages. Real estate agents ranked second, with 70% salary growth after 20 years on the job. Salary growth for the remaining three occupations ranges between 20% and 30%. Students who graduate with an associate degree in real estate will be qualified for dozens of entry-level jobs, although eligibility for some positions may also require certification or a state-issued license. Four of the most common career pathways for real estate associate degree recipients are outlined below. Real Estate Agents and Brokers: Agents and brokers assist clients who wish to buy or sell homes, commercial property, or land. Agents typically work for real estate firms, while brokers are qualified to manage businesses on their own. Real estate agents and brokers must be licensed in all 50 states, although specific requirements vary by state. Appraisers and Assessors of Real Estate: Appraisers and assessors specialize in evaluating and estimating the overall value of homes, buildings, and land. These professionals are usually called on to look at property that is being bought, sold, mortgaged, or insured. Appraisers must be licensed in order to work on federal transactions (per federal law), and assessors must be certified to work in certain states. Property, Real Estate and Community Association Managers: These managers oversee operations and development for residential areas and/or commercial properties. They are responsible for ensuring the property under their care is safe, presentable, and compliant with all local and federal laws and regulations. Like agents and brokers, managers who buy and sell property must be fully licensed in the state where they work. Construction and Building Inspectors: These professionals inspect private and public properties to ensure all buildings and land space meet local and federal laws. Areas of concern include building codes, safety requirements, zoning ordinances, noise regulations, and environmental impact restrictions. Networking and continuing education resources provide opportunities for career growth and development. Professional organizations offer a great entry point for students who want to learn more about their chosen career path. Below, you'll find three of the country's most prominent organizations established for real estate professionals. These organizations host networking events, provide online trainings, maintain active job boards, and offer other services for career-ready college graduates. National Association of Realtors: Considered the largest real estate association in the country, NAR currently represents 1.1 million members in 1,200 local chapters and 54 state/territory associations. The organization's website is a compendium of real estate statistics, laws, ethics, academic research, and professional development opportunities. Commercial Real Estate Development Association: Founded in 1967, NAIOP is one of North America's largest commercial real estate organizations. Site visitors can access back issues of the quarterly Development magazine, purchase up-to-date buyer's guides, peruse job listings, and browse a calendar of local and national events. National Association of Real Estate Brokers: NAREB was established in 1947 to address racial inequality in the housing market and real estate industry. Member benefits include invitations to local and regional events, continuing education opportunities, and discounts on various services. Online programs can provide an affordable and flexible option for women trying to balance the demands of work, family, and education. We've curated a list of valuable scholarships specifically for women.